​We wanted to see whether differences in rhythmic ability in trained percussionists are specific to musical rhythms, or if percussionists show a generalized enhancement in timing beyond the musical domain. To test this, percussionists and non-percussionists performed two tasks that measure rhythmic ability. Click hear to read the full paper. ​Beat Tapping: Participants were asked to find, and tap along with the beat in a rhythm. Over time, another rhythm was introduced, overlapping with the first stimulus. Participants were required to tap only with the beat of the first rhythm. When this initial rhythm faded out, participants needed to switch to tapping the beat of the second rhythm. The second rhythm had tempo and meter that were either congruent or incongruent with the first rhythm (Figure 1). ​Rhythm Reproduction: Participants were required to listen to rhythms that ranged in beat-saliency. After hearing each rhythm twice, subjects tapped the rhythm back on a computer keyboard as accurately as possible (Figure 2). In all conditions of the Beat Tapping task, percussionists had significantly lower variance in their taps than the nonpercussionist group. In the switching phase, nonpercussionists had significantly lower tapping variance when the two rhythms were metrically congruent versus metrically incongruent. This effect only occurred when the tempi of the two rhythms were also congruent (Figure 3). 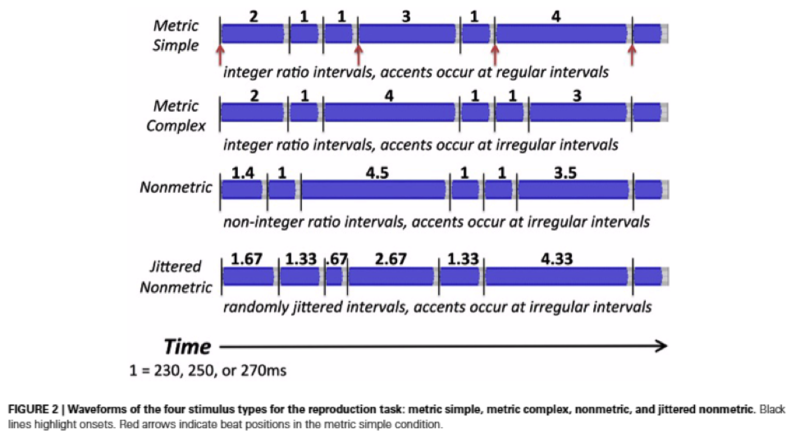 ​​Group differences in mean asynchrony were only significant for the finding, continuation, and switching stages of the task when the tempo was congruent (Figure 4). In these differences, the percussionist group had significantly less asynchrony than the nonpercussionists. Within-group analyses showed that nonpercussionists had significantly lower asynchrony when the two rhythms were metrically congruent, compared to metrically incongruent, in continuation and switching phases of the task. This effect was only significant for tempo-congruent trials. Similarly, in the percussionist group, significantly lower asynchrony was observed for metrically congruent, compared to incongruent, rhythms during the switching phase of the task. This effect was only significant when the tempo remained congruent. For both groups, the largest proportion of correct trials occurred for metric simple rhythms. Proportion of correct trials degraded subsequently for metric complex, nonmetric, and jittered nonmetric conditions. However, in each of the metric conditions, percussionists had a significantly larger proportion of accurately tapped trials than nonpercussionists (Figure 6). ​Generally, percussionists show less variance and less asynchrony while tapping the beat than do nonpercussionists. An enhanced rhythmic ability is also evident in percussionists’ increased accuracy for rhythm reproduction. Interestingly, the increased timing accuracy of percussionists is not limited to rhythms with a beat. Though both groups reproduced rhythms more accurately in the presence of a beat, the percussionist group outperformed the nonpercussionists in all conditions. This suggests that while percussionists do rely on the beat for accurate timing, their enhanced skills can be generalized to temporal sequences that do not contain a beat, or are musically implausible.